1. Lehigh (6-5) — The only real blemish from non-conference play is a loss against Stony Brook, when the Mountain Hawks managed a season-low 57 points. Other than that, Lehigh's losses came against teams no lower than 130 in the KenPom rankings. What's scary for the rest of the league is that the Kempton/Ross/Price/Leufroy quartet has plenty of help. Pat Andree made national news for knocking down his first eight and 10 3s total against St. Francis, and look at the combined shooting of Andree, Matt Holba, Brandon Alston, and backup point guard Jordan Cohen. This team is a legitimate eight deep. 2. Bucknell (8-5) — Surprise, surprise, Bucknell is balanced and primed for a crack at a sixth regular-season title in seven years. The Bison have six players who, when on the floor, take at least 23% of their team's shots and no one takes more than, surprise, Nate Sestina's 27.7%. Meanwhile, Nana Foulland has taken the jump. The junior is the best conference post player outside of two-time POY Tim Kempton and is shooting a ridiculous 76% at the rim, per hoop-math. His only weakness, and one to watch out for, is 48% shooting from the FT line. 3. Boston (5-7) — The Terriers limp into league play, having dropped six of their last seven. For a team that attempts 43% of its shots from 3, 33.8% isn't good enough from long range. The Terriers' shooting woes start with Eric Fanning (8-27, 29%), who probably should just stop launching from deep. More surprising is Chedi Moseley (21-62, 34%), whose touch has dropped precipitously since hitting 39% as a freshman. Speaking of youngsters, 6-7 freshman Tyler Scanlon boasts the second-best O-rating on the team and is a respectable 35% from deep. A freshman to watch in league play. 4. Holy Cross (6-7) — There's nothing surprising here. Holy Cross is old, with a bench that plays just 20.4% of minutes (350th out of 351 teams nationally). Holy Cross is slow and deliberate, averaging just 61.8 possessions per game (348th). And the Crusaders rely heavily on the 3, attempting 45.7% of their shots from deep and connecting on a pedestrian 35.3%. Holy Cross already has three games in which it hit double-digit 3s, including 14 in an insane last-minute loss to Monmouth. As our guy Sam Healy pointed out, what makes the Crusaders tough to guard on the perimeter is that it's their big guys hitting 3s as opposed to small guards. Robert Champion (6-6), Karl Charles (6-6), Malachi Alexander (6-7) and Matt Husek (6-11) are the main shooters, and you can see who's using the Crusaders' possessions in different lineups below. 5. Army (6-6) — Say what you want about Army and its weak non-conference schedule, but the young Black Knights deserve to be ranked in the league's top half and are one of the most intriguing teams going into league play. Freshman forward Matt Wilson is helping Army fans move on from the Kevin Ferguson era. Despite playing just 17.1mpg, Wilson is averaging 11.2ppg on 65% shooting. It will be interesting to see how teams match up with Army's fast attack (their 73.5 possessions per 40 minutes is 46th nationally). 6. Loyola (6-5) — KenPom projects a 63-62 Loyola win over American tomorrow in the league opener, and we're going to barely side with the Greyhounds here, too. Of course, positions could be flipped come Monday. I have a hard time understanding how bad of a scorer Andre Walker can be when it seems like every time I look up, the junior is making a game-winning shot. He's clutch — give him that. 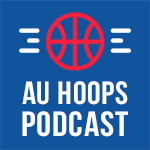 AU's emphasis should be on making him leave the 3-point arc, which has been his only efficient scoring area this year. Only two Greyhounds have shot better than 50% on two-pointers this season. 7. American (3-8) — The X-factor for the Eagles in league play will be Lonnie Rivera, who's just finding his form after not playing in six of the Eagles' first eight games. Nobody attacks the rim better, where Rivera attempts 57.9% of shots and makes 63.6% of them. And what Rivera adds defensively and rebounding with his length, too, will be a key for American going forward. To get a better feel for Rivera's contributions, see his numbers per 40 minutes. Navy must miss Will Kelley, whose block rate of 13.0% was second nationally. The team's two-point defense has fallen from 45.9% to 56.5%. A bit tougher to explain is how opponents are shooting 39% compared to 35% from 3. Regardless, teams will be able to score much easier on Navy in league play this year. 9. Colgate (2-11) — The Red Raiders have beaten just one Division I team, Cornell way back on Nov. 16. If there's a silver lining it's that of Colgate's 11 losses, seven have been by single digits. They're not just getting blown out. A player to watch in league play — freshman Will Rayman. The 6-8, 200-pound freshman can score inside and out, having reached double figures in nine of his first 13 games including 28 vs. Penn State. 10. Lafayette (4-7) — The good news: The Leopards' defense per 100 possessions is better than last year. The bad news: it's still really poor (111.0 vs. 114.8 a year ago). As was the case last year, there's simply not enough firepower on the roster to overcome such poor defense. Fran O'Hanlon hasn't had a defense finish in the top 300 nationally in efficiency since 2013. The American University Eagles fell 65-45 to Army Sunday, their 10th consecutive loss and sixth straight to open Patriot League play. The Eagles are 346th out of 351 teams in KenPom's statistical rankings. Only five other teams have worse records. The Eagles are one of just nine D-1 teams with two or fewer victories. In summation, there is more than enough evidence now — both from simply watching every game and numbers — to conclude that this team is very bad and likely won't drastically improve in its final 12 games. Instead of a one-hour podcast this week to dissect the team's ills, here is a shorter blog that might be easier to stomach and at least take up less of your time. First off, which upcoming game offers the Eagles the best chance, according to KenPom, to pick up that first elusive Patriot League victory? Lafayette is the second-worst team in the league, and Holy Cross has lost three in a row. Sure it's a road game and sure Lafayette still has that Nick Lindner guy, but the Leopards don't have much after that. In particular, they're awful on defense — giving up 1.06 points per possession vs. Patriot League opponents, 8th in the league. Additionally, Lafayette is the worst team in the league at turning opponents over with a turnover rate of just 15.9, which could aid the league's worst in that category (even in the Patriot League, AU's 21.2% rate is dead last). Finally, the only thing Lafayette has done relatively well in league play is shoot the 3 (36%); that's also the one area of the floor the Eagles have defended OK (33.4%). First off, it's Phil Bender Day and it's Mike Brennan Bobblehead Day. If you don't get up for that then stick a fork in these Eagles! In all seriousness, the Crusaders are in all-out struggle mode after starting league play 2-1. In three consecutive defeats, they have lost by an average of 20 points — sound familiar? — and are now dead last in the league defensively, giving up 1.09 points per possession, and allowing opponents an E-FG% of 55.5 and 43% from 3. Also, Holy Cross is at least close to the Eagles in the lack of experience category with average experience of 1.66, according to KenPom, compared to AU's 1.49. Freshman Karl Charles has been one of the Crusaders' go-to guys for most of the season, but the youngster seems to have hit a wall during the losing streak — scoring just two and nine points the last two times out. I'm not saying AU will win either of these — predicting an Eagles victory at this point isn't a smart exercise — and if they drop them both, expect AU to be looking at 0-14 in the league when it faces Lafayette in a rematch at Bender Feb. 17. Now let's jump into a few reasons why American sits in this predicament, winless in the league and losing their PL games by an average of 15 points a game. So while being ahead at the break would be nice, the Eagles have absolutely been in every game. But for whatever reason, they've forgotten how to shoot in the second halves of games; their deficits have increased; and then when the Eagles get sped up facing double-digit holes, the shooting percentage gets worse. When you are facing a deficit, getting outrebounded, and turning the ball over, this is a recipe for getting blown out of games. And that's exactly what's happening. I'll get into senior Jesse Reed's struggles in a minute, but first here are the shooting splits in league play for AU's second- and third-leading scorers Paris Maragkos (9.5 ppg) and Delante Jones (8.9 ppg). The numbers aren't glaring, but they give a glimpse of the Eagles' offensive slippage in second halves and how they're not getting the ball to two of their most productive offensive players in positions to score. By now it's clear that Jesse Reed is not a No. 1 player on a team. That's not a knock against the senior, who is leading the Eagles in scoring at 11.5 ppg, but simply a truth. Reed thrived as a No. 3 or No. 4 guy the past two seasons playing on the wings of a spaced offense, hitting spot-up 3s and slicing and dicing his way to the basket. Reed was expected to come in and be a leader on this team as its best player and one of just two seniors with Marko Vasic. That simply hasn't happened. It's not his style or demeanor. And while Vasic is more of a natural leader, he doesn't do enough on the floor and hasn't simply played enough to effectively assume that role on a squad with four freshmen in the rotation. Too often, Reed is deferring during the first 30-plus minutes of games. Most blistering, he doesn't force the issue when American is going through the early second-half droughts that have been its demise. Those are the situations in which Reed needs to pull the trigger on 23-foot 3s from the wing (he's shooting a solid 36.8 percent from 3), or come off a down screen and curl into the lane for a pull-up or to create contact. Unless American gets the ball to Maragkos early in the shot clock — his 56.5 e-FG% is a team-best — Reed has to be the late shot-clock guy or the guy who demands the ball when things are breaking down, and that hasn't happened nearly enough. Thus American's brutal scoreless stretches as opponents take over games. Something's clearly ailing Charlie Jones, and his minutes are dwindling — quickly. There's no doubting that Jones is American's best pound-for-pound defender as evidenced by Brennan subbing him in for the first time vs. Army Sunday in the final seconds before halftime solely to guard Kyle Wilson. Jones has the best steal and block rates on the team and the third-best defensive rebounding percentage. Yet Jones' offense hasn't been there all year. Really, he hasn't looked for it. His stroke is still there, as we saw when he swished a turnaround 3 right before the halftime buzzer vs. Boston U, but he's not looking to shoot when he receives the ball on the perimeter and it's clear, too, that with the season not en route to a Patriot League championship, coach Mike Brennan favors getting as much experience for the freshmen Delante Jones, James Washington, Lonnie Rivera and Andrija Matic as possible as opposed to playing Charlie Jones or Vasic, whose minutes have fluctuated greatly but not slipped as much as Jones'. American fell 72-54 to Bucknell Wednesday night to drop to 0-3 in Patriot League play. As he has talked about recently, head coach Mike Brennan is tinkering with several lineups to try to find some that work for the struggling Eagles (2-12 overall). I tracked throughout the game the combinations Brennan used — 13 total. See below for which fives worked best for the Eagles, and we'll see what the staff goes back to as AU tries to get its first win Saturday at home vs. Lehigh. *Stopped tracking when American started fouling at 62-52 Bucknell in the closing minutes.